I plan on trying to get some movies watched this weekend (besides the Christmas marathon I am having). I am hoping to fit in some of my unwatched collection... but don't want to limit myself to just the unwatched DVDs. So I am not having any theme to this marathon. Nick Cannon, Mena Suvari and Ving Rhames star in this horror film based on the George A. Romero classic zombie film. A mysterious virus has infected the small town of Leadville, Colorado, and the military is brought in to enforce a quarantine and stop the spread of the disease. As people perish, survivors realize that the virus is creating the walking dead who crave human flesh. Only a small number of people are immune to the virus, and those few survivors must battle to fend off the infected zombies while trying to make it out of town alive. This is the first time I ever watched this remake... if you can call it that. This is one of those remakes that really don't follow the original very closely. That is not really a bad thing... but I would have liked to see some more resemblance to the original then this. This one really is a little more then a name only remake. And it probably is better looked at as a stand alone movie then a remake. So is there anything making this a worthwhile watch? Sure... some of the effects are pretty cool. And the storyline... if it wasn't trying to pass for a remake would be pretty good. But it is definitely not a movie that would win any awards. 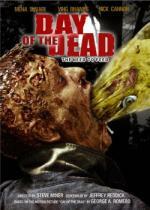 Just a leave your brain at the door... somewhat enjoyable zombie movie. I don't mind the fast zombies... but in this case they were maybe a little too fast as a lot of things went by so fast you barely got the chance to see it. And I must say I didn't care for the zombie crawling the ceilings. These are Zombies... they don't need spider powers. One thing I was looking forward to in this movie is what they would do with Bud... the zombie with military background in the original. And he is in this one as well... which in one way they handled it in a humorous way. But at the same time I had to shake my head at it. If you decide you want to check this one out... please do so but keep in mind that this is not what I would call a true remake. It is pretty much a remake in name only. I went into this one knowing this ahead of time and I think this helped me enjoy it some. So maybe it would help you as well. A poetic review of any zombie movie, Pete! HE'S BACK. A hero for our millennium. And not a moment too soon, because during the five years (much longer in movie-fan years!) Superman sought his home planet, things changed on his adopted planet. Nations moved on without him. Lois Lane now has a son, a fiancé and a Pulitzer for "Why the World Doesn't Need Superman." And Lex Luthor has a plan that will destroy millions - no, billions - of lives. Filmmaker Bryan Singer (X-Men, X2) gives the world the Superman it needs, honoring the legend everyone loves while taking it in a powerful new direction. Brandon Routh proves a perfect choice to wear the hero's cape, leading a top cast that includes Kate Bosworth as Lois and Kevin Spacey as Lex. And the thrills - from a sky-grapple with a tumbling jumbo jet to a continent-convulsing showdown - redefine Wow. "I'm always around," Superman tells Lois. You'll be glad he is. This is the first live action movie since Christopher Reeve was no longer able to play the character. My fear going into this is how it would feel seeing someone new in the role after seeing the wonderful job Christopher Reeve did. But I have to admit Brandon Routh did a great job and it felt like he showed the role the respect it deserves. I enjoyed Kevin Spacey as Lex Luthor as well. I can't think of anyone that could have done it any better. Then we come to Kate Bosworth as Lois Lane... this is where I was left feeling a bit cheated. I just didn't buy her as Lois Lane. I don't know what it was about her.... but it just didn't feel quite right. As for the story itself... I think they did an outstanding job. While watching this movie I got the feeling while watching that I haven't had since the first couple movies. I think that alone is a great accomplishment. This is one I would definitely recommend... and would love to see more movies come... as long as they don't start replacing the title role with every new movie like they did with the Batman movies. Note to Jimmy... This is a recycled review... no need to add it to the list! Unless you want to replace the other one with this since it has more info on the DVD Release and the stars rating. Harry Angel, a down-and-out fifties Brooklyn gumshoe, takes us on a journey of violence and murder that canvasses the desperate streets of Harlem, smoke-filled jazz clubs of New Orleans, and ultimately to voodoo rituals in the sweltering swamps of Louisiana. "Angel Heart"... A truly unsettling film experience. I remember I watched this movie when it first came out... way back in the VHS days. But I had not seen it since. So watching it today was almost like watching it again for the first time. I really did enjoy the story... thought Mickey Rourke did a fine job (and I don't normally like him).... and I liked Robert De Niro as Louis Cypher. And then of course there is Lisa Bonet (Denise on Cosby Show), I definitely couldn't complain about her role! Though I bet Bill Cosby had some thoughts on the subject! As I said... I did enjoy the storyline. But I do have one gripe about this movie... it was so predictable. I knew where it was going so early into the movie. Now that I watched it again.... I remember thinking basically the same thing the first time I saw it... which is probably why I waited so long to add this one to my collection. 4 and a half for this? I've never succeed watching this entirely, always fall asleep... Even Superman 3 is more entertaining than this and you know I hate Superman 3 or The Richard Pryor Show... Emo superman, thanks but no thanks. Thanks Jimmy.... and what can I say? I love Superhero stuff almost (maybe even just as much?) as my horror! and you know I tend to like stuff that many other people don't. I agree with Jimmy! I wouldn't get past the first scene, I guess it improves, right Pete? 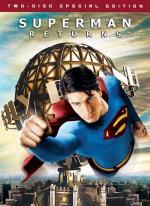 I also really liked Superman Returns. Well... all I can say is I liked it from start to finish (other then Lois Lane... Kate Bosworth just didn't do it for me)... so all I know is take that where ever it leads you. Oh... it was nothing against her personally... I just didn't like her in this particular role is all. Of course I am not that familiar with her to be honest... the only other thing I have with her in it is Blue Crush which I only seen once... years ago (well that and the Superman Documentary Look, Up in the Sky!). Superman Returns is wonderful. Very nostalgic though, which may count against it. I can't understand why there is so much hate against it (not necessarily here) as it really is a marvellous film. Only the sub-plot with Lois' kid let it down for me.